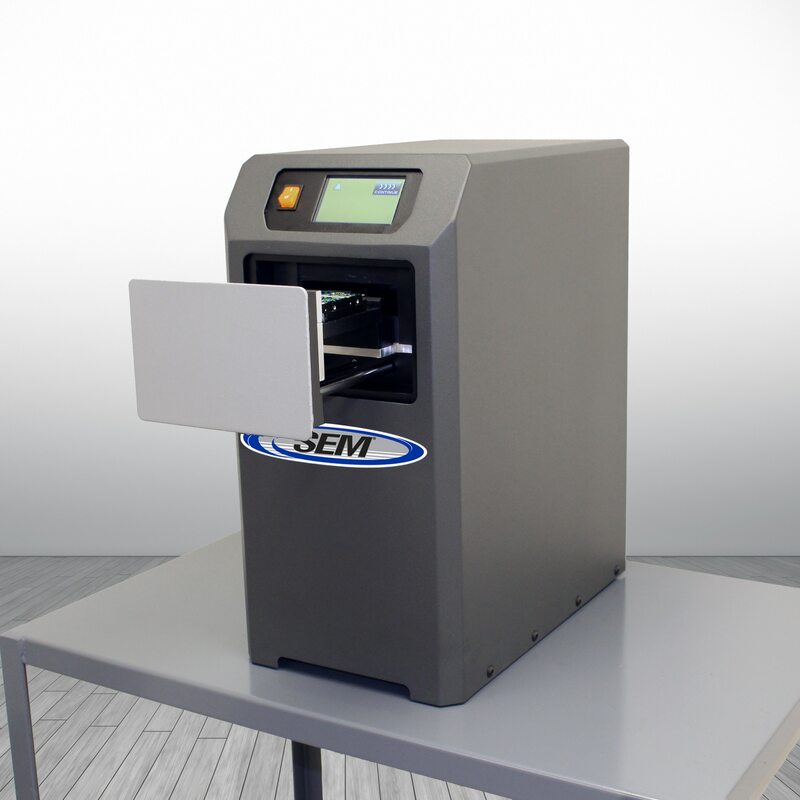 Field Report & Equipment Test–Introducing the New SEM Model 0202 OMD: Optical Media Destruction at its Finest incorporating the Latest in Cutting Edge Technology. Security Engineered Machinery (SEM) has recently added a new NSA Approved Optical Media Destroyer to their highly durable product line. The SEM Model 0202 OMD is a machine designed specifically to destroy optical media (CDs, DVDs) and meets the NSA/CSS 04-02 requirements for classified media destruction. I found myself asking what makes this optical destruction machine better than the rest and is this just another run of the mill shredder? After all, SEM was already successfully offering the SEM Model 0201 OMD-Optical Media Destroyer with great performance reviews in the high security marketplace. So I figured I would put the new SEM Model 0202 OMD to the test and get a firsthand glance. My first impression was WOW, Made in the USA! Finally, an optical media destroyer with an LCD Display providing continuous visual operator status and an easy to use interface! I could not wait to fire up the machine and see how it worked, I already was impressed with the aesthetic features, but the bottom line was the performance. I shredded piles of optical discs and was able destroy up to 2,400 discs per hour, absolutely amazing for a machine with such a small footprint. I also was impressed with the small residual particle size of 2.0 mm X 3.9mm which even smaller than the NSA’s required standards—the more secure the better. Knowing SEM places heavy emphasis on protecting the environment and being ISO 14001 Registered. I was curious to see if this machine incorporated some features to meet those eco friendly objectives. I was pleasantly surprised to find out this machine does not require lubrication via bottled oil. Instead, SEM has incorporated environmentally friendly vegetable oil lubrication sheets. These lubrication sheets are fed into the 5.5” disc slot for routine maintenance of the cutting head. Unfortunately, many data destruction machines are energy hogs and keep your local power company in business. The SEM Model 0202 OMD will actually help reduce your electric bill as the system features auto shut down and also an auto sleep mode. The final and perhaps most important test criteria is safety. Upon my equipment test, I noticed the SEM Model 0202 featured a door open shutoff safety interlocked with auto shutdown. I was unable to operate the media destroyer when I opened the door. I had an extremely hard time jamming the machine during recommended usage, but when I exceeded the threshold I noticed the machine had auto reverse and manual reverse options. No need to risk inserting your fingers to retrieve optical disks. I also liked the fact this machine featured an ECC (Electronic Capacity Control) which provided me with a visual feed rate meter to safely feed materials. If you are interested in learning more about the SEM Model 0202 OMD Optical Media Destroyer please visit the SEM Website.